Well, Thanksgiving 2014 has come and gone and I hope your holiday was as wonderful as you’d hoped it would be. Mine was fantastic! We had a group of about 10 people for dinner and more friends came later on for drinks and dessert. 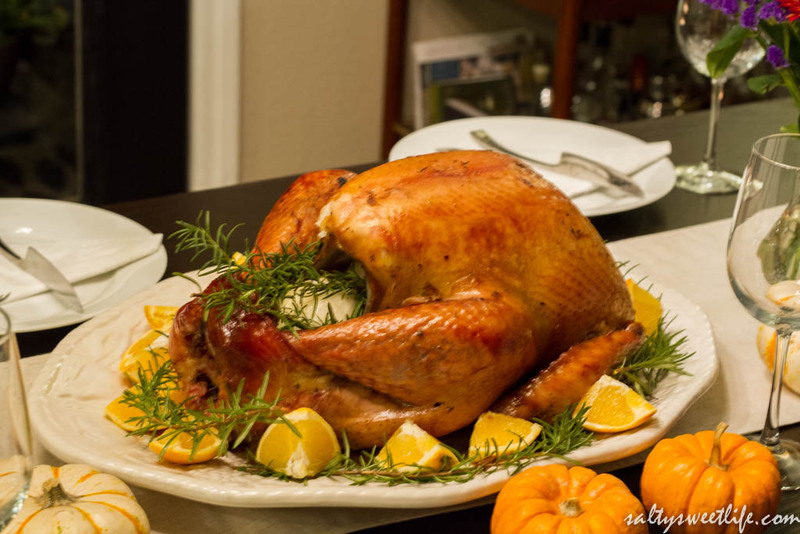 I can’t even believe that it’s already December, but before we hurl ourselves full force into Christmas mode, I wanted to share 5 things that I learned from this year’s Thanksgiving dinner. 1. Turkey Technique 101. There’s a good way and there’s an even better way. I made two turkeys this year and both employed techniques that I hadn’t used before. I had intended to make two small 12-14 pound turkeys using the Spatchcocked Turkey with Anise and Orange recipe on the November cover of Bon Appétit Magazine. But, being thrifty, I really tried to get a deal on those two turkeys without having to drive all over town. Turns out this is an impossibility. Yes, you can get great deals on turkeys, but you will have to drive all over town. There’s a long and boring story of how I ended up with a 17 pound turkey and a 13 pound turkey but, I’ll spare you the details. This year, I decided to use a dry brine for both birds. This is new for me, as I normally season the turkey right before putting it in the oven. With a dry brine, you coat the turkey with the seasoning the night before and let it sit overnight in the refrigerator. 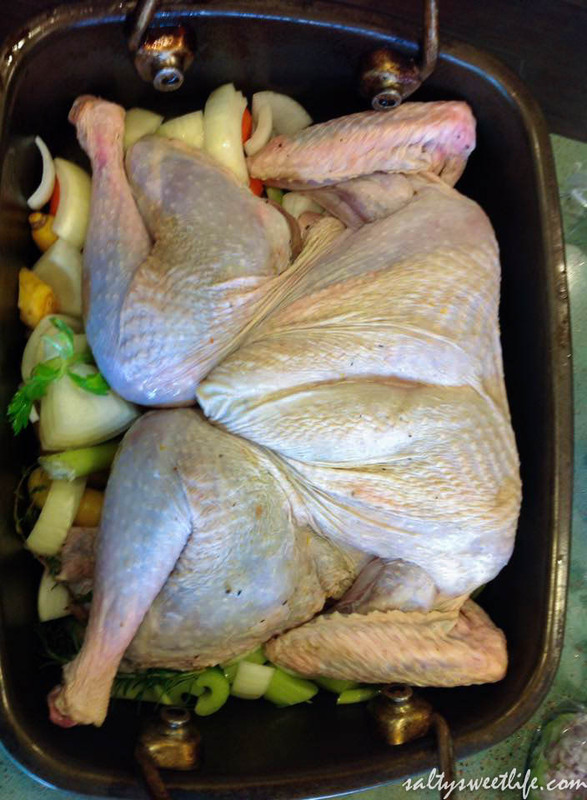 Then, rinse the turkey and pat it dry before roasting it. 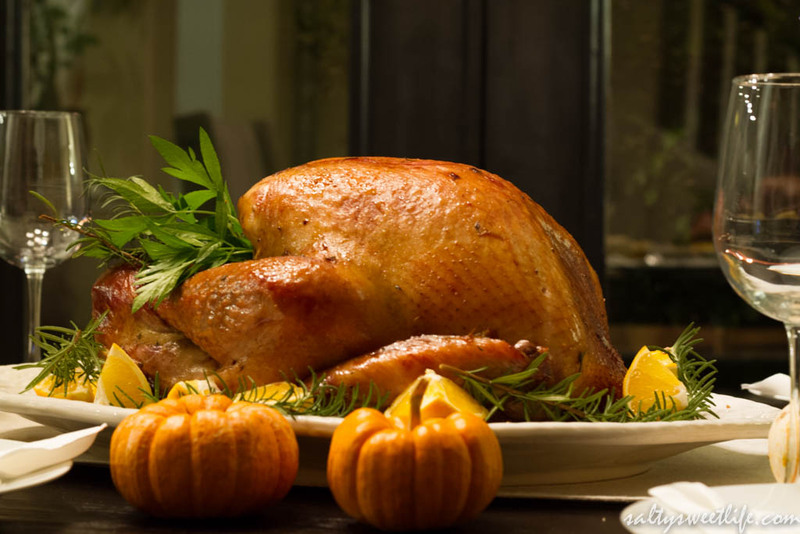 The dry brine helps season the turkey, and the salt tightens the skin, resulting in a very juicy and tender turkey. It’s a great technique if you don’t want to deal with the complications and refrigerator space requirements of a wet brine. I roasted the large turkey using a basting blanket. I have never used this technique before, but a friend of mine does this and I remembered drooling over the photos of her beautiful bird last year and I wanted to give it a try. 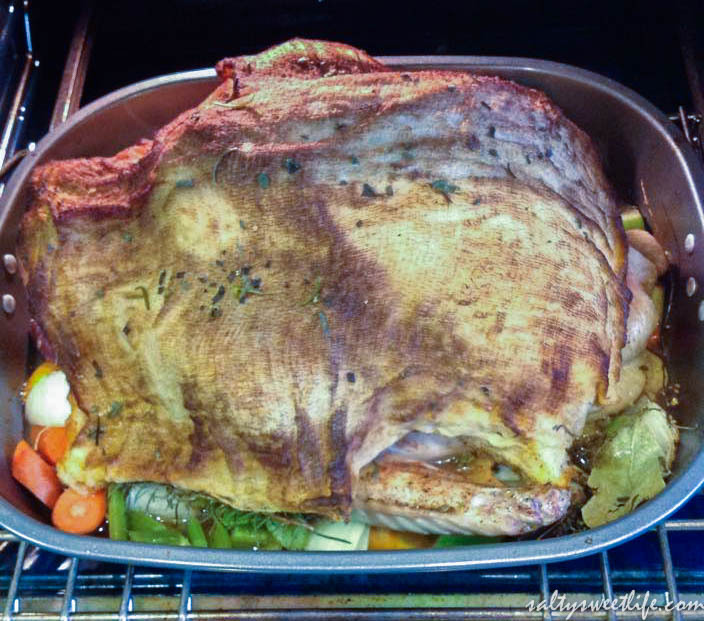 Turkey cooking under a basting blanket. Before placing the turkey in the oven, I made a basting mixture by combined a stick of butter, some turkey stock, white wine and chopped herbs in a saucepan. I dipped a cheesecloth in this mixture and draped it over the bird. I basted the turkey every half hour, finally removing the cheesecloth for the last 15 minutes to brown the turkey. On the upside, the turkey was beautiful. Like, magazine cover beautiful. The meat was moist, rich and flavorful, but, I didn’t like the skin as much, because it was rather chewy. I’m not sure if the basting blanket was the culprit here but if I had to do it all again, I’d stick to my normal turkey roasting technique of roasting uncovered at a high temperature for 30 minutes and then slow roasting for the remainder of the time. However, after making the Spatchcocked Turkey with Anise and Orange, I may abandon the traditional turkey method for good! This recipe was absolutely stellar! Hands down, this turkey was far superior in flavor, texture and moisture and what’s most amazing is that it took exactly 90 minutes to cook! The skin was golden and crispy and spatchcocking eliminates the problem of the breast meat drying out before the dark meat has a chance to cook thoroughly. It only took a little bit of effort to remove the backbone with kitchen shears. Here’s a quick tutorial of how to do it with a whole chicken. I was a little bit nervous about using aniseed because that can be a very powerful spice, but it paired beautifully with the orange-y notes in the spice rub and was a unique and fabulous twist to our traditional turkey! Mom’s first words upon tasting it: “This turkey tastes like sausage!” I don’t know about you, but in my book, that is a complement! I would wholeheartedly recommend that you try spatchcocking a turkey when you have the opportunity–plus you get to say “spatchcock” which is probably the best word, ever. This year, I decided to make several dishes from the November issue of Bon Appétit Magazine. I made the Extra Buttery Mashed Potatoes and even bought a potato ricer for the task. The potatoes were creamy, fluffy and oh, so very buttery! The potato ricer was kind of a revelation as well. I prefer to keep one-task kitchen tools to a minimum, but I’ll make an exception for this one because it really did make the potatoes creamy without the gumminess that can come from over-mashing potatoes. 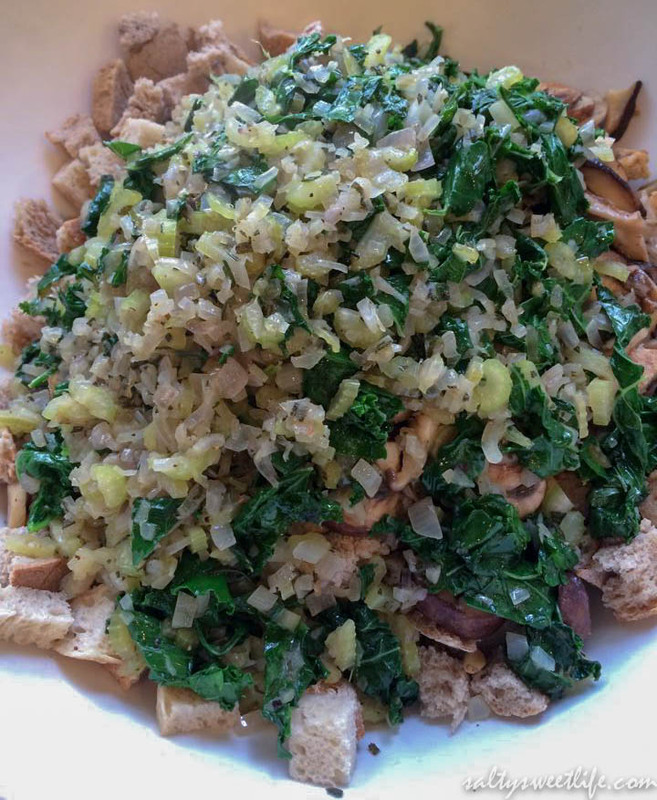 I also made this rye bread, kale and mushroom stuffing. I’ll admit, this was my first time using real bread that I cubed and dried and I don’t think I’ll ever go back to commercially bagged stuffing. There’s just so much more texture and flavor. What I also learned was that it is both freeing and comforting to follow a good recipe, step by step. I am always second guessing recipes, but it was fun to actually force myself to follow a recipe to the letter (except for the stuffing recipe, I made a few minor changes to it). I’m not sure why I never thought of doing this before, but you know how it is in that last hour when the turkey has cooled but there’s no more room in the oven to keep it warm? If you have a gas or propane grill, it can be your best friend at this crucial moment. I lit one burner on low heat and placed the platters of carved turkey (covered in foil) on the grill. It warmed the turkey without drying it out and everything was piping hot at serving time. Just remember not to place the platters directly over the flame. My mother always taught me that the first task on Thanksgiving morning is making the turkey stock from the turkey neck, giblets, carrots, celery, onions, salt and pepper. I’ve always done this on the stove top and while it has always worked, it does take up valuable real estate. Meanwhile, my trusty crockpot just sat in the pantry unused until it was called upon to keep the mashed potatoes warm. Well, this year, a little light bulb went off in my head and I made the stock during the night in the crockpot. I woke up to a pot of rich, golden turkey broth that I used for the stuffing and the gravy. Also, after every Thanksgiving dinner, I wrap the turkey carcass in foil and put it in the freezer to make more stock in the future. The only problem with this is that it takes up a lot of room in the freezer. 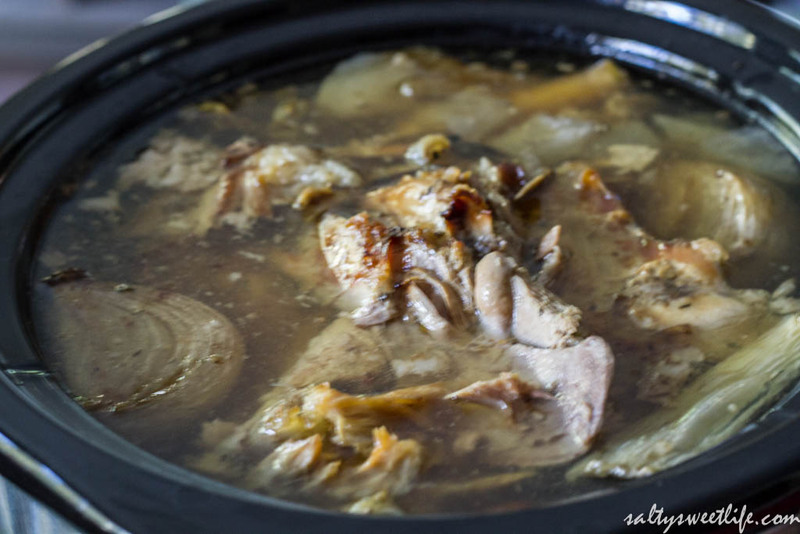 What’s more, by the time I need to make stock, the carcass is frozen solid and won’t fit into my pot, which leads me to my next tip: after Thanksgiving dinner is over, put the turkey carcass into the crockpot and make another batch of stock overnight! Again, why have I never thought of doing this before? Now I have 3 quarts of homemade turkey stock in my freezer that’s ready go when it’s time to make soup! This isn’t pretty, but it’s hard to pretty up a carcass. We are incapable of taking pictures during a party. Notice that the photos above were mostly iPhone photos taken before the food was finished? Between the cooking and taking care of our guests, we were lucky that we managed to take a photo of the turkey. From here on, I’m tasking my guests with taking photos of the food, because apparently, we just cannot. 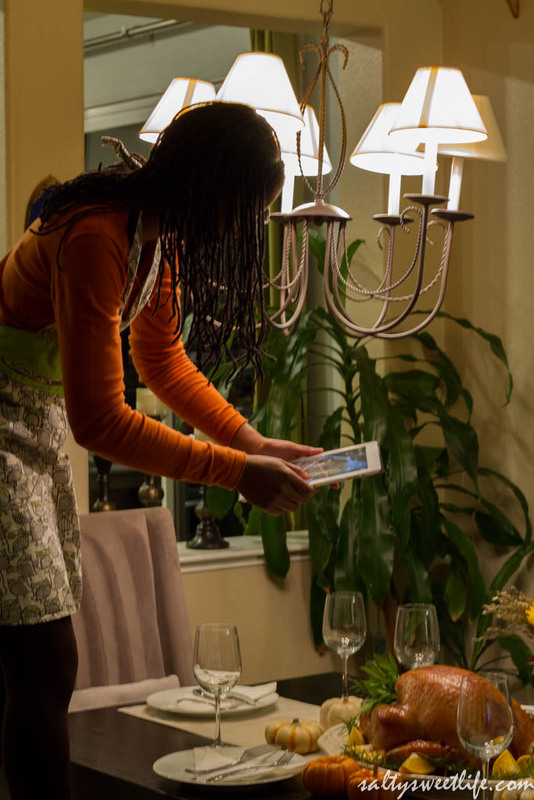 So, my friends, if you are reading this and you’re coming to my house for dinner, you’re the photographers! I’ll set up a hashtag. I hope these little tips and tricks were helpful! Did you learn any new tricks this year? I’d love to know in the comments. I did a post on spatchcocking and vowed to do that with my next turkey. But we’ve been away the past two Thanksgivibgs. Guess I’ll have to do it for a Sunday dinner. Haha! Thank you! Yes that’s the 6th trick! Just don’t fall if you’ve had a glass of wine or two! The grill has totally come in handy! Thank you Julie! I really think spatchcocking is the way to go now! I may never go back to traditional! I tried the basting blanket one year and didn’t like it as much either. Plus I thought it just made things extra messy to deal with. I’m totally adding in kale to stuffing for next year! I also made stock in the crockpot and it’s hands down the best thing ever. Completely doing that from now on! Andrea, thank you so much for stopping by! That is so good to know that you didn’t like the basting blanket as well. It was a little messy but I really missed the crispy skin! And the stock! Oh my goodness it is so good! Can’t believe I hadn’t used the crockpot before! Such great turkey tips! Glad to have the idea of the stock in the slow cooker, too. I hadn’t thought of that. I love the side shot of the bird on the table! Thank you Lori! The slow cooker stock was one of those “duh” moments! But it’s definitely a keeper! That chicken looks absolutely divine. I am literally salivating at the mouth right now, thank you sharing your thoughts on the basting blanket I think I shall give it a miss. Oh by the way, your pictures are stunning. Thank you so much for the compliment Charlene! And thank you for stopping by! I definitely recommend the spatchcock method–the skin is so much more crispy and flavorful! Have a happy New Year! Like the idea of taking out the back bone of turkey thanks. You’re welcome! It’s a great technique! Spatchcock is the only way I cook any type of roasted poultry! Love the idea of using the BBQ as a warmer. You are such a clever cook.